See Bob Mould on this week's "Austin City Limits"
Another reminder of how much PBS’ “Austin City Limits” has changed its tone since Bob Mould himself called Austin home in the mid-‘90s, the former Hüsker Dü co-leader is featured in this week’s episode of America’s longest-running TV music series. The show will air locally on TPT 2 at midnight Sunday (as in right after “Saturday Night Live”), and again on TPT Life at 10 p.m. Sunday. The producers for the show -- which was an exclusively all-twang affair up until the ‘00s -- coolly paired the ex-Minneapolitan with Southern Cali rockers the Delta Spirit to fill out the second half of this week’s show, making one excellent episode based on two of last year’s best concerts locally. For the TV cameras, Mould and his feisty bandmates Jason Narducy and Jon Wurster whittled down the set they played on tour last year, with some of Sugar’s “Copper Blue” and one song from the new “Silver Age” album rounded out by three Hüskers songs (you can see the set list here; or better yet, wait for the show). The “ACL” episode is one of three new ways to see Mould on the small-screen. Ahead of his Feb. 28 “Late Night” appearance, Jimmy Fallon’s website just premiered the surprisingly comedic video for “Star Machine” (from “Silver Age”). Was Wurster a “Second City” cast member before he played in Superchunk, or what? 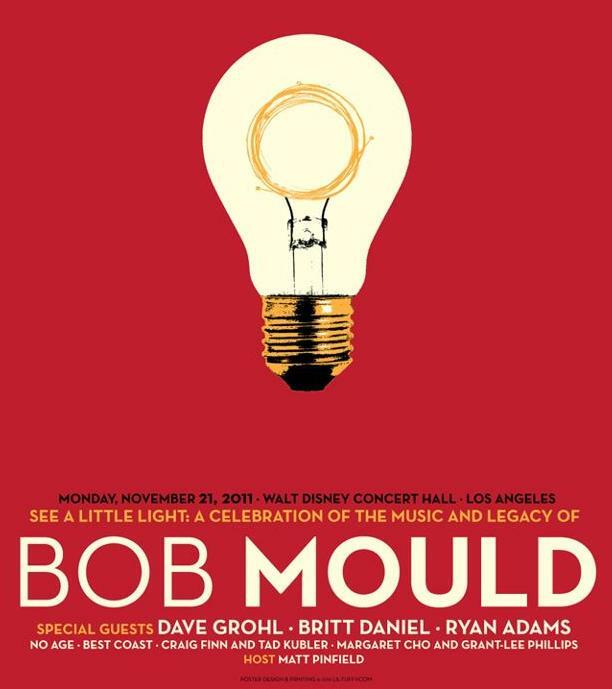 Meanwhile, the concert film from the all-star tribute to Mould at the Walt Disney Concert Hall in November 2011 -- titled "See a Little Light: A Celebration of the Music and Legacy of Bob Mould" -- is now available as a $10 stream/download. A DVD version of the movie was also funded through a recent Kickstarter campaign. The show featured Dave Grohl, Craig Finn and Tad Kubler (the Hold Steady), Britt Daniel (Spoon), Ryan Adams, No Age and Grant-Lee Phillips playing his songs, along with Bob himself. You can hear snippets of the songs for free here. Oddly enough, there happens to be some Hüsker Dü news to report, too: Chicago reissue label Numero Music is prepping a new limited-edition of the band's first single, "Amusement" b/w "Statues" to be released for Record Store Day (April 20). The 7-inch set will also include "Writer's Cramp" and "Let's Go Die," two other tracks from the same Blackberry Way studio session as "Statues." The remastered version of "Statues" is newly posted online. These tracks have gone out to collectors in various forms over the years, but there's excitement for the single nonetheless. Perhaps it's the first baby step in a long-overdue and highly justifiable retread treatment of the band's catalog, which Mould hinted at in our interview with him last year.